Every year, Robb Report feature their Ultimate Gift Guide which spotlights the most extravagant gifts of the year available anywhere, ranging from an amphibious aircraft and a soaring submersible to a one-of-a-kind grand-touring car and an incomparable cruise. 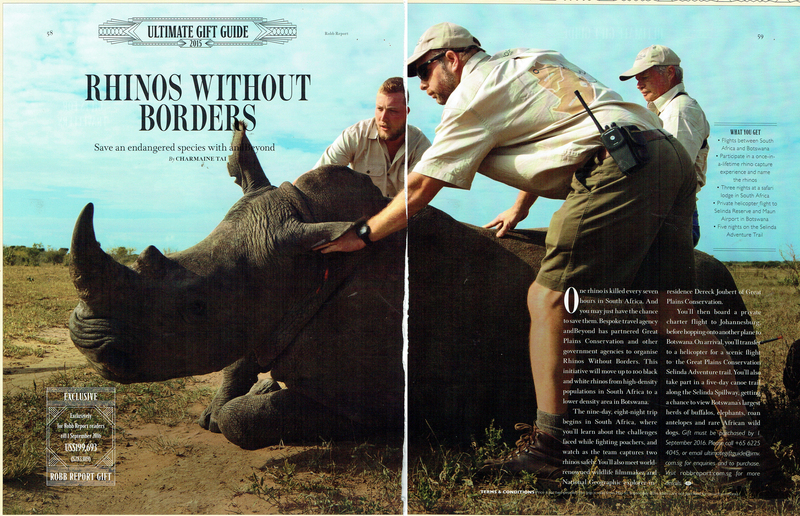 This year, they featured a one-of-kind Rhinos Without Borders itinerary for US$199,693 – which includes flights from South Africa to Botswana, a chance to participate in a RWB rhino capture, 3 nights at a 5 star safari lodge in South Africa, 5 nights in Botswana as well as helicopter flights between camps. Download the double-page spread here to read more .